A 6.0 Magnitude Earthquake Struck the South Pacific. | Chaos Sweeps Away the World We Know! The Disaster, current events & Catastrophe Blog. Forecasts for 2014 to 2022. Read tomorrows news today! Plus current economic, commodities, stock indices and financial news. ← A 6.5 Magnitude Earthquake Struck South of the Kermadec Islands. 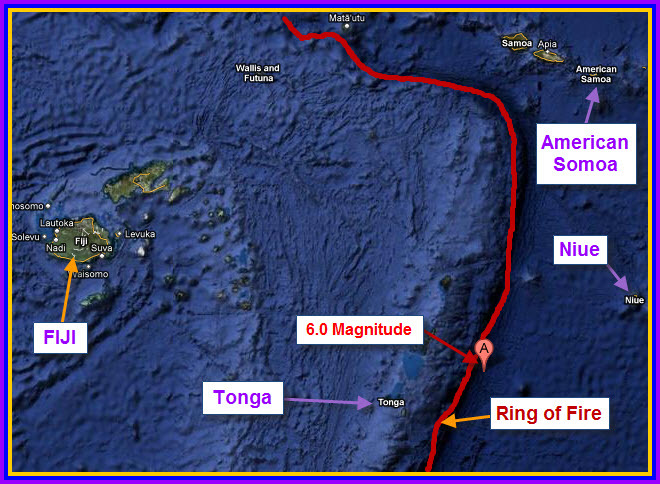 October 8, 2011 – A 6.0 Magnitude Earthquake Struck Near Tonga: The Kingdom of Tonga is in a very earthquake prone area of the South Pacific Ocean. Tonga was the scene of seven earthquakes, of 7.0 magnitude or greater, since 1973. The latest one was on March 19, 2009 and was a 7.6 magnitude event. Today’s quake was at a depth of 19 kilometers (12 miles), however, according to the NOAA Pacific Tsunami Warning Center; no Tsunami Warning or Watch has been issued. The tremor was 137 miles ENE of Nuku’Alofa, Tonga; 138 miles SSE of Neiafu, Tonga; 238 miles WSW of Niue Island (see map); and 1,558 miles west of Papeete, Tahiti, French Polynesia. It was 9:53PM at the epicenter, 4:53AM in New York, 3:53AM in Chicago, 2:53AM in Denver and 1:53AM in Los Angeles. This entry was posted in Earthquake, Fiji, Misc, Miscellaneous, Nature, News, Pacific Ocean, Ring of Fire, Samoa, South Pacific Ocean, The Kingdom of Tonga, The Ring of Fire and tagged 6.0 earthquake near tonga october 8 2011, american samoa, fiji, fiji islands, neiafu tonga, niue island, nuku'alofa tonga, papeete tahiti french polynesia, paradise of the south pacific, samoa, The Master of Disaster, the pacific ocean, the south pacific, tonga earthquake, tonga quake. Bookmark the permalink. 1 Response to A 6.0 Magnitude Earthquake Struck the South Pacific. Why is Iceland not included?